Offering spacious and bright rooms throughout this well presented second floor, purpose-built one bedroom flat offers a stylish fitted kitchen, attractive reception room as well as a neutral décor bedroom. 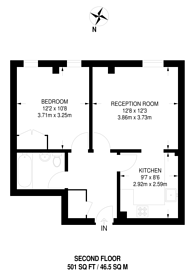 Spacious and modern 1 bed flat. Close proximity to Harrow & Wealdstone station with easy access to trains into central London within 15 mins. Ideal for a first time buyer or investor. Headstone Drive is enviably located boasting close proximity to the fast train out of Harrow and Wealdstone Station and a wide variety of local shops, bars and restaurants while a larger selection is moments away in Harrow town centre. 501 (46 Sq M) approx.